Artist’s impressions of The Reynaers Institute ... state of the art. Reynaers Aluminium, a leading European provider of innovative and sustainable architectural aluminium solutions, has embarked on a major expansion, which will see its staff strength rise significantly in the Middle East as its regional operation diversifies its business model. Reynaers Middle East – the regional arm of the Belgium-headquartered company which this year marks 50 years of operations – is now set to reach out to a lucrative market segment, namely the home owners of the region. The company, which provides support for architects, fabricators, solar installers, project developers, investors and end-users, said big plans are under way to cater to this retail mode of business. Reynaers Middle East’s current business model has been catering to its projects business, which encompasses high-rises and commercial and residential buildings. “The new strategies adopted will also facilitate project business,” said Ali Khalaf, managing director of Bahrain-based Reynaers Middle East. “As part of the expansion plan, a new warehouse and factory has already become operational in Saudi Arabia, catering to the B2C (business to commerce) business,” he added. Reynaers Middle East has initiated a drive to increase its staff count from 15 to 50 within two years. Apart from its regional hub in Bahrain, the company set up a branch office in Egypt in 2012 and in Dubai, UAE, last year. The parent company’s drive towards further sustainable expansion includes strengthen its logistical and production capacity to meet the anticipated growth as well as honing its research and development (R&D) and innovation capabilities. In this arena, it said, the focus will be on the integration of the latest digital technology in the development, testing and experiencing of new systems. Supported by this expansion drive, the company is aiming to increase its turnover of €330 million in 2014 to €500 million ($364 million to $551.9 million) by 2020. To achieve this, it will invest more than €50 million ($55.2 million) in Belgium, France, the UK, Turkey and the US over the next two years. More than half of this investment will be devoted to the expansion and renovation of the Reynaers site in Duffel, Belgium, it said. “The construction industry is by its very nature conservative, but it should not ignore the latest technological and architectural evolutions. It is crucial for us to embrace innovation and to build on it in order to establish our growth sustainably,” said Martine Reynaers, CEO of Reynaers Aluminium. “We, therefore, do not only invest in new buildings, and logistical and production capacity, but also in the integration of digital and other technological applications in our R&D, measuring, testing and manufacturing processes. In doing so, we assure ourselves that our systems will, in the future, continue to respond to the highest quality and design requirements that the complex construction sector increasingly imposes on us,” he said. In Duffel, Jaspers-Eyers Architects have started the expansion of the group’s headquarters. The new four-storey building will feature a high-tech showroom for an optimal experience of its systems; an area dedicated to virtual simulations; an auditorium; and conference rooms and offices. The warehouses are expanded by almost 20,000 sq m. For the expansion of the ERAP (emergency response assistance plan) isolation section and for the testing, training and automation centre, the oldest warehouse will be demolished and completely renewed, the company revealed. 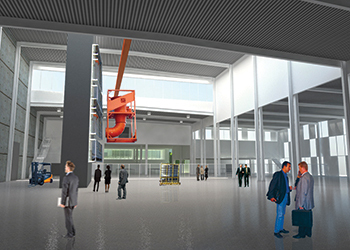 One of the showpieces of the testing centre will be the brand new state-of-the-art testing wall for facades with a height of 15 m. This enables the most advanced air-wind-water testing of multi-storey facades. In addition, the testing walls for window and door systems are also expanded, while a new stand is provided for cyclic and mechanical testing. This part of the Reynaers Institute, which will occupy a major portion of the building, also accommodates the ‘FabLab’, a special lab for R&D projects in which solutions will be tested at an early stage through the use of rapid prototyping and 3D printing. To increase its influence in international markets, Reynaers is expanding its presence in foreign offices. This includes boosting its logistical capacity in France with the expansion and renovation of warehouses in Ham, as well as the headquarters in Lieusaint. 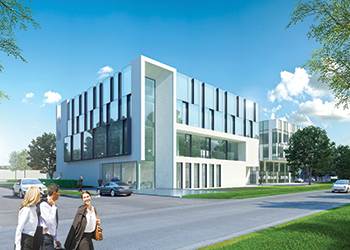 In the UK, Reynaers will move to a new office building and warehouse, which will enable it to enhance the speed of its service delivery and increase its logistical capacity. In the US, the company plans to expand its recently opened sales office and logistics facility at Phoenix on the West Coast. Anticipating a rapid growth in the construction market in Turkey, Reynaers is spreading its wings there with a new office and warehouses. Finally, its Alural subsidiary which specialises in powder coating for aluminium products, will see its office building and production capacity expanded. Reynaers Aluminium’s product line includes a wide variety of window and door systems, curtain-walling, sliding systems, sun screening, conservatories, skylights, screens and systems to incorporate blinds and ventilation grids. Established in 1965, it has offices in more than 30 countries worldwide.